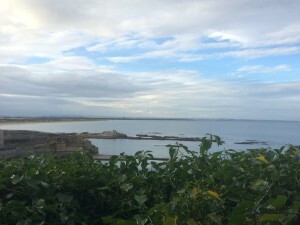 Photo shows green foliage, semi-cloudy sky over open ocean with jetties of rock jutting out into the water. Taken by Maxx Borges, near a cliff-side by St. James Catholic Church, St. Andrews, Fyfe, Scotland. 04 September 2016. For those of you just checking in, or for those that haven’t read my About Me page (don’t worry, I don’t blame you), I’m Maxx! 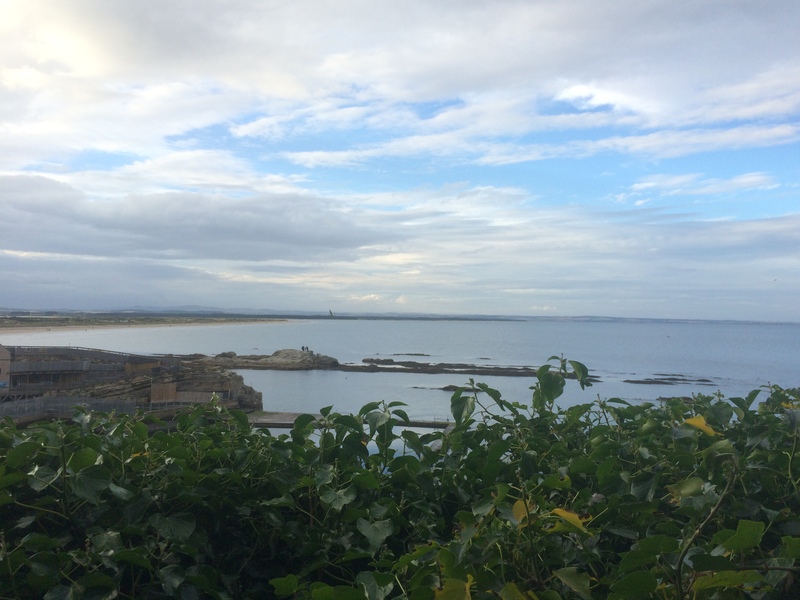 I’m a third year student at Whitman College studying abroad at the University of St. Andrews in Scotland, and I just finished my first week here. In all, I feel a bit like a fish out of water, and as a third year student, it’s a bit disconcerting. I’ll lay it out for you. Fresher’s Week is the start of it. It’s an entire week dedicated to those students who have only just arrived in St. Andrews and have no idea what’s going on. Unlike the US universities, it’s this intense process where there are over 30 events going on every day and you have to get to them all on your own. Most first year students – affectionately called Freshers – are expecting this kind of whirlwind and confusion. To be honest, as a third year student, I really wasn’t. Back at my home university, I’m already considered an upperclassman, I know my way around campus, and I know what I’m doing. Well, for the most part. But I guess that’s one of the reasons I decided to go abroad: to challenge myself and get out of my comfort zone. St. Andrews may be a cozy place for some, but for me, it was like being on another planet. Street signs not actually on the street but on the walls of buildings? Cars coming at me from the ‘wrong’ direction? A campus spread out over the entire village almost 15 minutes from where I live in student housing? Modules??? It’s overwhelming, like being a first year at my home university all over again, except this time, I can’t claim inexperience and beg everyone around me for help. Most of my classes are for 2nd and 3rd years, to top it all off. And they definitely don’t pander to the students here. What to do when you’re freaking out about getting what you need done and still having fun? Breathe. Maybe it’s stereotypical of me, but sitting for a second and gathering myself has been such a help these last few days while running around to get the classes I need at times that don’t clash with each other. Speaking of, I just came back from my first class, Beginning Russian. Man, I’ve never seen so many squiggle lines in my life. But that’s not the point. The point is that classes have started, people are figuring things out and stumbling along like baby deer on shaky legs, and it’s okay. I’m not the only one and it’s all okay. I’ve heard too many people wistfully wax poetic about how they would do their whole first year differently if they had known then what they know now. And as I sit here reflecting, worrying about massive amounts of text to read in books I don’t yet have, I realize that that’s exactly what I can do. I have that advantage of having third year knowledge and going through a first year (or rather, semester) somewhere completely new. All of those people I wished I had talked to? I can talk to them here. All of those events or clubs I wanted to attend but was too afraid to go to on my own? I’m going to them. The classes I thought I couldn’t handle? I am handling them. Yes, it’s not exactly the same, but what in life is? When you have a second chance to experience things and you have some sort of guideline, why not make changes? I think a lot of it has to do with being okay with yourself and letting go. Being determined to keep things the same in a place that doesn’t even play by the same rules seems a little silly and a whole lot unwise. There is so much to offer here and so many smiling, though unfamiliar faces, like the girl from Bulgaria that gently corrected my Russian pronunciations and called them cute when I succeeded; like the guy from northern England who chatted with me about Star Trek: The Original Series while we were waiting for our food to be done in the communal kitchen’s wonky microwave; like the sweet girl from southern Scotland who got me a tiny cake when she found out it was my birthday last Saturday. I don’t talk much, as a rule; I’m more fond of listening. As someone already set in their ways, with friends back home and a routine to follow, it’s hard being thrust in a setting where you have to do those things, to give and to take, to speak and to listen in equal amounts with people that may not necessarily even understand the culture you come from. It’s hard to go into the unknown with a smile on your face, a nervous twist in your stomach, and a healthy sense of adventure. But that challenge? That’s why I went abroad. Updates expected to be on Monday evenings. This entry was posted in St. Andrews, Uncategorized on September 12, 2016 by borgesml. It really is amazing here and yes, the gowns are amazing! 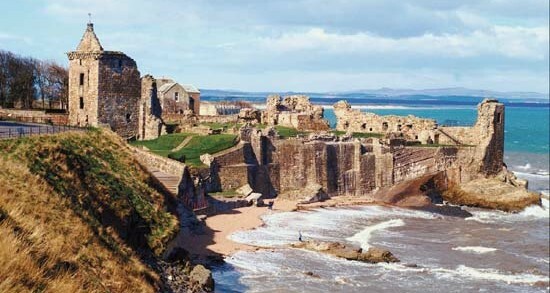 I’ll email you about the offer and we can talk more about St. Andrews as a whole. Thank you for commenting. I’m so excited that it had enough of an impression on you that you still talk to the friends you made years later. I hope I can make those kinds of connections. Thanks! Bravo, Maxx! Can’t wait to hear more about your experience abroad. Still taking German? Hello! Amazing to hear from you and yes, I am taking German and we’re reading a few noveellas this semester. Glad to keep you posted! Have the very best time! I will definitely let you know! I’ll have plenty to share.